It would be nearly impossible to create a film centered on Stephen Hawking’s life story and not have it be unbelievably intriguing. The theoretical physicist, world-renown cosmologist and best-selling author has stunned the world with his hypotheses and ground-breaking discoveries, all while living decades past his short life sentence when diagnosed with ALS at the age of 21. So, as can be expected, director James Marsh’s The Theory of Everything is undoubtedly fascinating, albeit slightly depressing as viewers watch the physical deterioration of a man and emotional dissolution of his marriage. Still, Hawking’s life story—which has the potential to leave the average audience completely confused given his difficult-to-understand discoveries—is simplified into an easy-to-follow yet thought-provoking plotline. The love story between Stephen (Eddie Redmayne, Les Miserables) and Jane (Felicity Jones, The Amazing Spider-Man 2) outshines both the backdrop of his physics career and the ongoing progression of his debilitating disease. In fact, the playing out of the promise to love “in sickness and in health” is one of the most heart-wrenching and well-established themes in the film, although the storyline of Hawking’s college years and subsequent career are similarly absorbing. Furthermore, Hawking even gave Redmayne his blessing and lent his real electronic voice to add another degree of authenticity to the film. Finally, the film has been admired for its clean cinematography, high quality imagery, stellar soundtrack and superior directing. The film’s stars, Redmayne and Jones as well as its production team and director, Marsh, have already been predicted for an assortment of award nominations in the coming weeks for their work both in front of and behind the camera. The movie is now nominated for four Golden Globe awards including Best Motion Picture, Drama; Best Actor, Drama: Eddie Redmayne; Best Actress. Drama: Felicity Jones and Best Original Score: Jóhann Jóhannsson. However, the movie undoubtedly has a few glaring shortcomings. For one, deeper research reveals that not all of the information presented is wholly accurate. 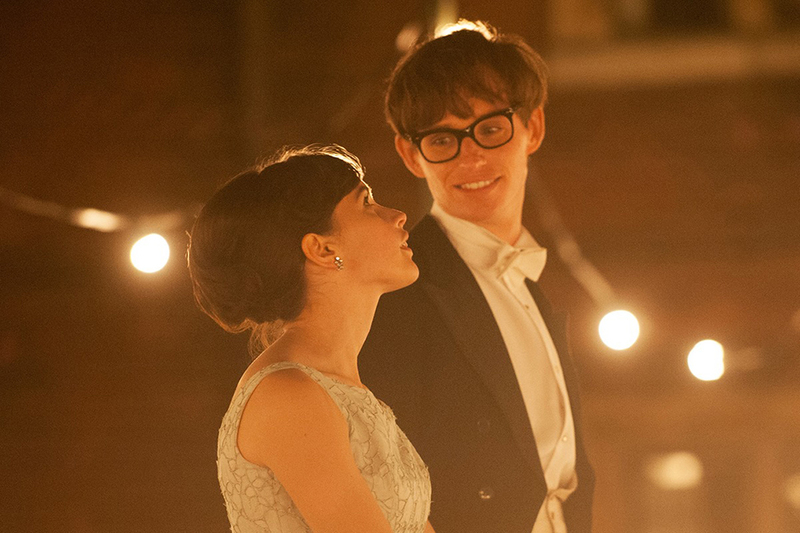 Although the film was adapted from Jane Wilde Hawking’s memoir Travelling to Infinity: My Life with Stephen, the content is likely optimistically slanted. Because Stephen had to give final approval during the film’s post-production, it understandably presents the legendary scientist in an absolutely pristine light. Left out are the details about his love affair with his nurse and his well-known arrogance that came with young fame. These details would have brought more depth to the film and would have given viewers a deeper understanding of the difficulties of his life. In The Theory of Everything, Stephen can do absolutely no wrong, to a point that it begs viewers to look up the real truth after viewing the impossible story of a seemingly perfect person. Additionally, while the entirety of the film presents intriguing and relevant information to the featured story of his life, perhaps its biggest weakness comes with the fact that it ultimately lacks any sort of climax moment. The film instead falls flat, although it can nearly get away with it given the gravity of the material present throughout. Nonetheless, the ending lacks a complete sense of conclusion since the majority of the product lacks a sense of building and action. Although the slightly erroneous representations and anticlimactic storyline can leave something to be desired, nevertheless, the biopic leaves audiences with a sense of awe and captivation due to the aforementioned strengths: the strong acting, quality cinematography and, most of all, sheer nature of the content. After all, the observation of the life of a man who was given two years to live at age 21 and is still changing the way we view our world at age 72 is, inarguably, riveting and provides one of the most thought-provoking movies of the new year.